I think about Henry's birth a lot. At least once a day. See, my heart and soul were born that day, too. My heart and soul for Conrad is bigger and stronger than ever, but something about the heart and soul we have for our babies. It's magic, and it's huge. I wrote my birth story here. That's what happened. But there were pieces of that day (or four days) that I remember here and there, and I never want to forget them. When I was first admitted to the hospital, I had this one nurse, Sally, and her younger trainee, who's name I learned but forgot. It was Sally's duty to insert my IV. She searched my arm for a good vein in vain (I kill myself), so she put the IV into my hand. I remember that hurting more than anything else - more than contractions, more than the epidural, more than healing from the C-section. Because I was in labor for so long (over twenty hours), I had several different shifts of nurses. Sally finished her shift a couple hours after I was admitted (and got the IV from hell), then came back for another shift the next day while I was still in labor. The trauma of the IV was so overwhelming that when she came into the room the next day, I saw her and started crying, and when she left, asked for another nurse. It was nothing personal at all, but since she had been the one who had caused me pain, I felt really tense with her near. Now that it's over, I feel terribly rude for sending her away, but would probably do the same thing every time. I got an epidural about four or five hours into induced labor, even though contractions weren't that bad. I can't honestly say I had a rough labor. I had a long one, but it never got too rough. I stopped feeling it pretty early. 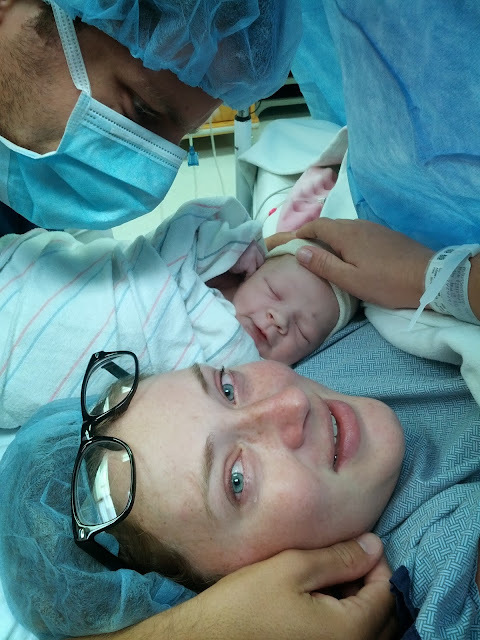 After twenty hours of labor, no sleep, a traumatic IV experience, and anxiety over the whole idea of having a baby, the doctor told me I was probably going to have a C-section. Only, they didn't send me in for surgery and get it over with. They left me for four more hours to see if labor might progress (it didn't), and consequently, to let the fear sink in. I have never been more scared, even though I always told myself that C-section was a possibility since my mom had two. The sheer panic (literally, hyperventilating) became a problem in the OR, and even though I was strapped down, I was heaving too much. The anesthesiologist talked me through some of the scarier stuff until Conrad joined me, and he even promised me he could give me some anti-anxiety medicine, but only once the baby was out, so I had to remain calm until then. I forced Conrad to talk to me about an upcoming vacation, since talking about anything baby-related sent me right back into a panic. It took about fifteen minutes before Henry was born, and they lifted him up for us to see. But because I was laying down, I couldn't see him - only Conrad could. I never saw my baby fresh out of me, and I remember feeling sad about it. Once he was out, as promised, the anti-anxiety meds came in, even though I probably didn't even need them anymore. That is where I fade out. I don't really remember anything until we were back in our hospital room. Next time, if I have to have surgery, I want to stay calm so I can remember everything. Conrad tells me what it was like for my parents and brother, who were in the waiting room. Conrad wheeled Henry out in the little plastic cart, and my dad jumped up and said "There they are! They're here!" They were cautious and nervous and didn't want to get too close, and they followed Conrad to the hospital room. They all stood around and watched a nurse clean Henry. Then, I remember how nervous I was to bring him home. We carried him into the bedroom, and I remember thinking, "I don't know how to take care of him here. I only know how to take care of him in the hospital!" I probably just felt safer with the nurses nearby in case I didn't know what to do, but that went away quickly. Those first days are so heavily instinctive, and there's such a magical cocktail of mama hormones that it's almost euphoric. 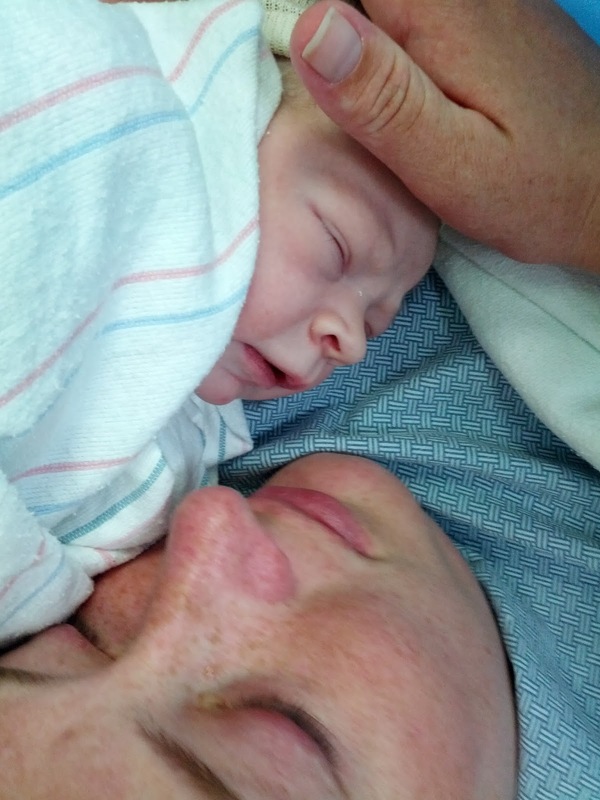 I was so overjoyed with my new baby, and aside from some fears and insecurities related to breastfeeding, I never really second-guessed myself. I want to remember how confident I was in my ability to mother. I remember in those early days, trying so hard to remember every single thing. I was so scared of forgetting how beautiful (seriously, I wept at the sight of him) my baby was, and the noises he made and how light he was and how his skin was wrinkly and soft and his legs were so froggy and skinny. I tried to write stuff in my journal and take tons of pictures, but I'm sure I've already forgotten some stuff. Which is why, I guess, I wrote this post. I love the pic of the three of you on Birth day. How awesome would it be if children remembered their existence, instead of always being reminded that they "forgot" their childhood. Raise the baby (and self) (and each other) like we can recall our own lives, especially the best moments. If it was good it would be easier to acknowledge. I love you. Tante T.